Big Bear City, CA – Shortly after 8:00 p.m. on Sunday, January 27, the Multi-Enforcement Team and patrol deputies from the Big Bear Sheriff’s Station served a search warrant at a residence on Glencove Drive in Big Bear City. 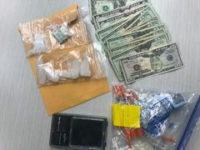 An ongoing investigation led deputies to believe that narcotics sales were taking place at the location. Deputies identified Trenton Sypniewski-Siep and Jesse Siep as two of the subjects at the residence. During the search, deputies found Trenton Sypniewski-Siep to be in possession of a loaded firearm while being under the influence of a controlled substance. He was also in possession of other illegal weapons. 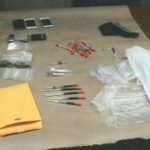 Jesse Siep was found to be under the influence of a controlled substance and in possession of paraphernalia. As a result of the search, deputies seized heroin, scales, and other paraphernalia consistent with the use and sale of illegal narcotics. 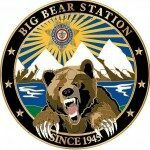 Trenton Sypniewski-Siep was booked into the Big Bear Jail on felony charges of possessing a controlled substance for sale and being under the influence of a controlled substance while in possession of a loaded firearm, as well as possession of unlawful paraphernalia and weapons. Jesse Siep was issued a citation on misdemeanor charges of being under the influence of a controlled substance and possessing unlawful paraphernalia. Additionally, Jesse Siep was cited for outstanding misdemeanor warrants for vandalism, possession of burglary tools, and a pending previous charge of possession of unlawful paraphernalia. Trenton Sypniewski-Siep had an arraignment hearing scheduled for yesterday, January 29, in San Bernardino County Superior Court.